I was trying to come up with something for dinner to go with my pickled oranges and thought I couldn’t go passed the classic combination of duck and oranges – using the idea of duck à l’orange and changing it to suit the flavours of the pickled oranges. It’s easy and delicious. Trim any excess fat from the duck legs. Mix together all rest of the ingredients in a dish or bowl and add the duck. Cover and leave to marinate in the fridge for at least an hour but preferably overnight. Turn the duck over from time to time. Take the dish out of the oven about 1 hour before you’re going to start cooking. Heat the oven to 150-160°C. Place the duck and marinade in an oven dish. Cook for at 45-60 minutes. Then turn up the oven to about 180° and cook for a further 20 minutes or longer. The duck will be a deep golden colour. If too much liquid has evaporated add a little stock to the dish. 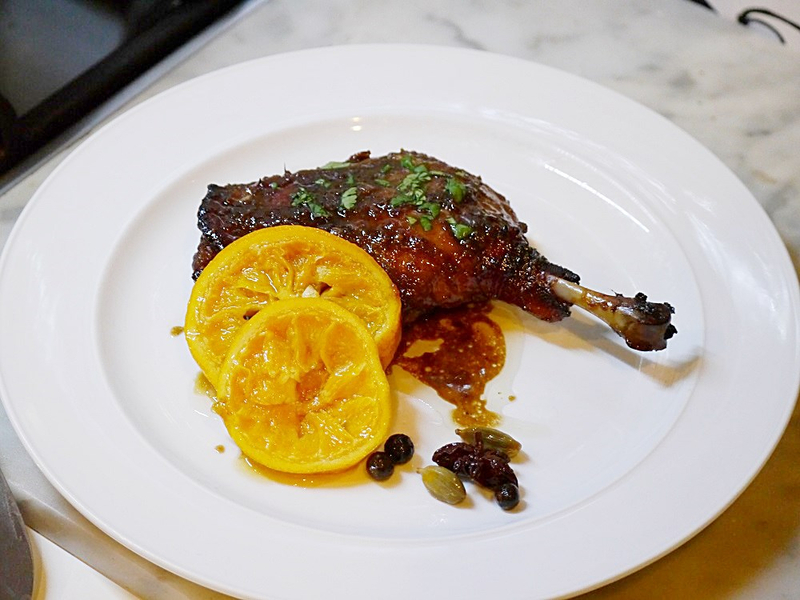 When cooked, remove the duck form the oven, cover and set it aside while you finish the sauce. If there’s not much left add some stock. Heat on the stove top scraping around the edges and skimming off any fat. Simmer for 3-4 minutes and then strain. Serve the duck with the sauce and 2-3 slices of pickled oranges.